"working to improve your park"
The Washington Square Park Task Force, convened by Community Board 2 and local elected officials to give some community oversight over the Parks Department “renovation” (redesign) of Washington Square Park, gathered recently for a public meeting in the NYU Silver Building on Waverly Place. This was the first meeting of the Task Force after a long hiatus. Rebecca Ferguson, Washington Square Park Administrator, gave a presentation about the status of Phase I work on the Park, some future details and took questions. The meeting was presided over by Community Board 2 Washington Sq Park Task Force(WSPTF) co-chairs Brad Hoylman (also CB2 chair) and Tobi Bergman. Also present were Steve Simon, Manhattan Borough Parks Department Chief of Staff, and representatives from the offices of local elected officials, including Council Members Alan Gerson, Christine Quinn, and Rosie Mendez as well as from Assembly Member Deborah Glick’s office. 1. STATUS : Presently, the Parks Department is at work on “Phase I,” the North West Quadrant of the Park, which includes the “scrabble plaza,” the Alexander Holley Plaza, and the Fountain and its Plaza. According to Rebecca Ferguson, the project is “100% on time” and “60% complete.” The contract for the work is up in November and the Parks Department has every expectation that it will be done on time. –THE WATER PLUME/JETS OF THE FOUNTAIN: When on, when off, who decides? The jets on the new fountain will be adjustable but it is unclear just who will determine how they are regulated. (Mayor Bloomberg, perhaps?) It’ll be nice for those tourists coming down Fifth Avenue viewing the Fountain through the Arch (per the wishes of redesigner George Vellonakis) to see the large water plume from their taxis. However that was never really the point of this fountain, used for politics, music, art, juggling, shout outs, etc., as Jane Jacobs so admirably expressed. An issue that the WSPTF did not address at this meeting is the square footage of what is deemed “the inner circle” around the fountain — from the outermost edge of the fountain wall to the innermost edge of any seating. The WSP Task Force wishes expressed in an August ’07 document to the Parks Department allowed for it to be “no less than 90% of the current area,” allowing for a 10% reduction (why?… I could not tell you). 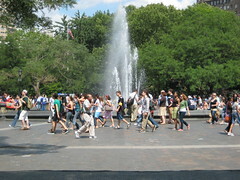 And what about the entire Plaza, extending outward from the “innermost circle?” This is certainly well utilized by the public and is part of the experience of being in Washington Square Park. Presently, there is a 23% reduction planned – a significant amount – something the WSPTF, to my knowledge, never addressed. What is the Gerson-Quinn Agreement? I think the Community Board could get some traction on this issue of the public space around the Fountain. … Stay tuned… there’s more! *This WSPTF meeting took place July 17th, 2008. **Go to Part II here. 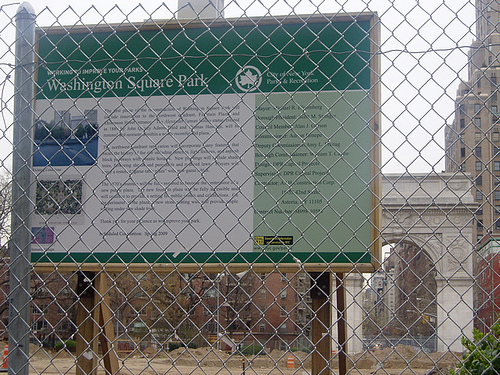 While looking up articles on Washington Square Park earlier this year, I came across a research paper by a student at SUNY(State University of New York) Syracuse College of Environmental Science and Forestry entitled: “Searching for the Soul of Washington Square Park: Employing Narrative, Photo-Voice and Mapping to Discover and Combine Pragmatic Issues of Urban Park Design with a Community’s Emotional Needs” (May 2007). It was written by Yamila Fournier as a senior project. Spending time at Washington Square Park working on her research, Ms. Fournier interviewed Park users as well as Parks Department “officials.” She investigated people’s routines at the Park and what they loved about it as a public space. She explored what the Parks Department procedures are for redesign of a park (the answer: there are no protocols in place). As she delves into the history and process of the redesign of Washington Square Park and the interactions between government agencies and the community, she ties together themes in ways that have not been fully explored elsewhere. I have excerpted parts of it here. 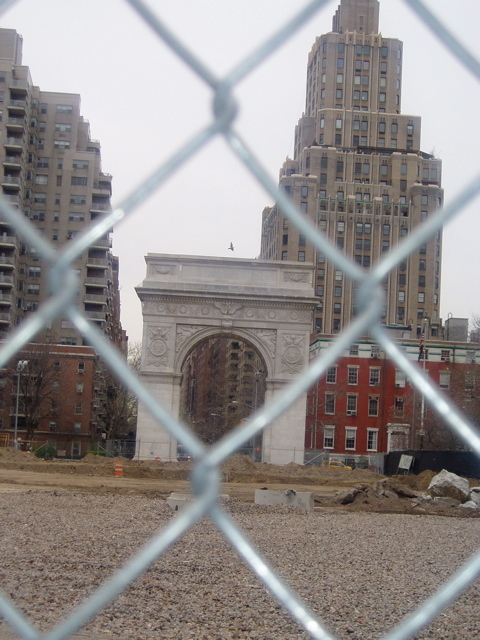 When the idea to renovate Washington Square Park was first introduced, the general consensus was that the park is in need of much repair. That is where all agreement ended. Since the plans for the redesign were unveiled in 2001, there has been no harmony. *renovating bathrooms, among other changes.